MANHATTAN — Embattled former International Monetary Fund chief Dominique Strauss-Kahn left his Tribeca apartment Saturday and may be headed to France, according to a report. Days after the sexual assault case against him was dismissed, the French pol and his wife Anne Sinclair were spotted carrying about half a dozen pieces of luggage from their rented Franklin Street apartment, the Associated Press said. French media say the one-time presidential candidate was headed home, although he would not say where he was going, according to the report. "I'm glad he's gone," one man who lives next door, but did not want to be named, told DNAinfo. "Between the paparazzi and French tourists...there were a lot of cigarette butts." Dominique Strauss-Kahn entered Manhattan Supreme Court with his wife, Anne Sinclair, by his side on Tues, Aug. 23, 2011. He and his wife watched the circus as Strauss-Kahn pushed his way through a throng of shutterbugs. "He had to push his way through them because they were in his way to get his picture," the neighbor said. "There was some tough guy stuff." Another woman poked her head out of her apartment and said: "Hey, how happy are you guys that we have our street back!" 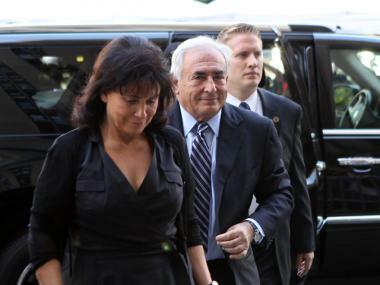 Strauss-Kahn has spent time in jail and under house arrest at the $50,000 Tribeca home following his arrest in May. He was accused of sexually assaulting a maid, Nafissatou Diallo, at a Midtown hotel, and then trying to flee the country. But the case was dismissed on Aug. 23 because of issues with the credibility of the victim, who is being named because she came forward. 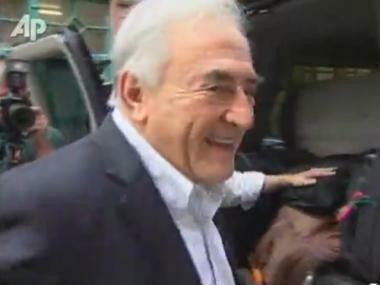 Strauss-Kahn was freed from house arrest nearly two months ago after prosecutors first questioned Diallo's story about the alleged attack and aspects of her background. His passport was returned after the case was dropped and he returned to Washington, D.C. on Monday to say goodbye to his former IMF colleagues, the AP said. On Thursday he returned to New York. In France, authorities are investigating whether he sexually assaulted novelist Tristane Banon during an interview in 2002. Strauss-Kahn has also been sued by Diallo.